Game graphics can make or break the game. The visual aspect of the game is usually the first thing a user will notice and if it doesn’t appeal to them, then the game is doomed to failure. From creating the characters, the objects, and the environment, whether in 2D or 3D, to creating the skeletons, texturing, and more, this is one of the most crucial phases when creating a game and each of the game graphics tools below excels in a different aspect that can be useful to your game. Below is a comprehensive list of the top game graphics tools on the market. Spine is dedicated to 2D skeletal animation, providing an efficient workflow both for creating amazing animation and for integrating it into your games. 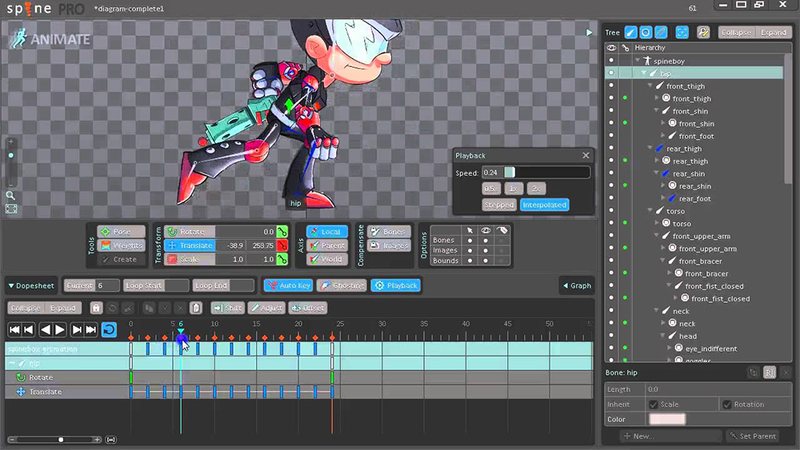 It provides numerous tools to shape and refine your 2D animations. Pricing: Free. Paid plans start at $69. 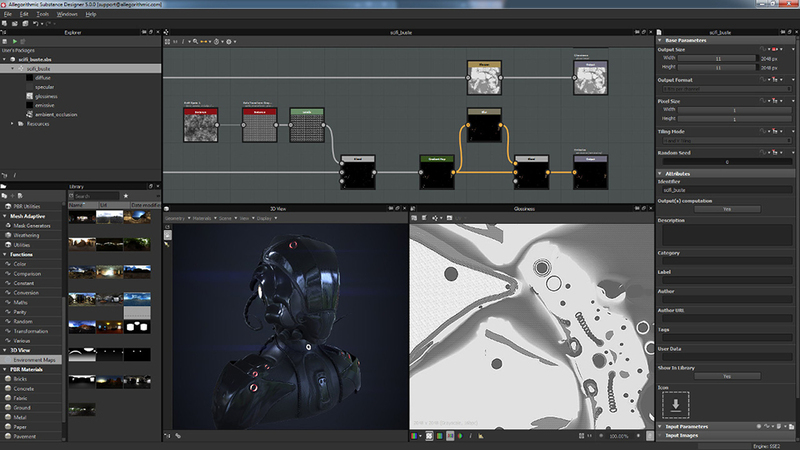 Substance Designer is a node-based texturing tool. It features a complete set of tools and filters including: Crop Tool, Color Equalizer Tool, Extract Channels filters (Multi-angle to Albedo, Multi-angle to Normal, Normal to Height), Smart Patch Clone Tool, Smart Auto Tile Tool. It allows you to create and edit materials and complete texture sets instantly with full control and infinite variations then export the them to any renderer or game engine, whether known or in-house. Pricing: Free 30-day trial. Paid plans start at $149. 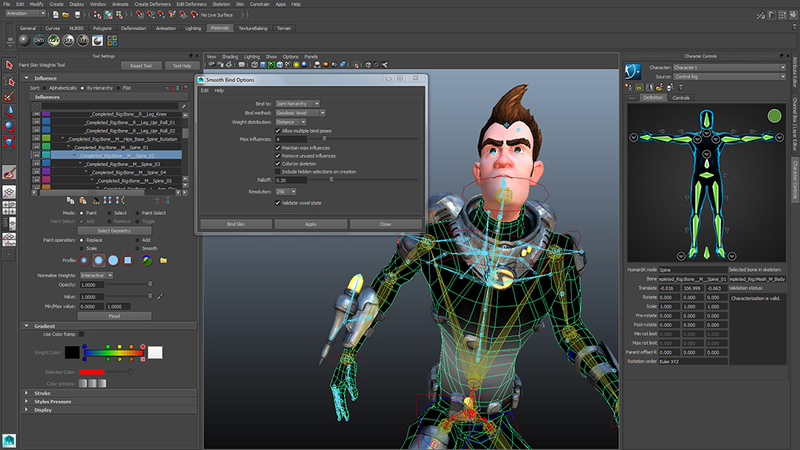 Maya LT is a 3D animation and modeling tool that lets you create characters and environments and make them a reality. It’s cost effective and mainly targeted towards indie developers. It can be conveniently used alongside multiple game engines like Unreal Engine and Unity. Yebis is a post-processing effects middleware that enables you to create beautiful, next generation, real-time, realistic environment effects utilizing HDR rendering. Pricing: Free trial. Plans based on demand. Enlighten delivers real-time global illumination. It computes indirect lighting at real time and allows you to control the way light is is reflected or absorbed by materials in the game. This allows you to to include player-controlled lighting in your game, all while maintaining consistent and high quality lighting. 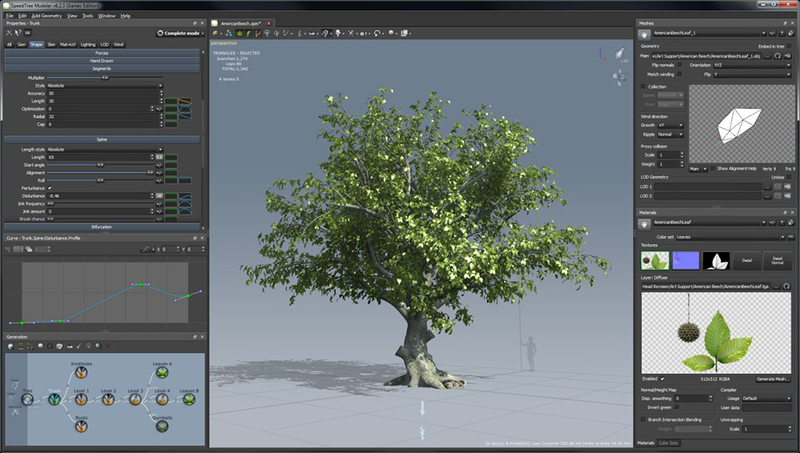 Academy Award-winning tool SpeedTree has been used in many major games as well as movies like Avatar, The Avengers, and The Great Gatsby. It offers tree modeling and rendering, allowing you to create your own flora and greenery in your game’s universe or take advantage of their library with hundreds of species and thousands of high-quality texture maps at your fingertips. Pricing: Free 30-day trial. Paid plans start at $19. 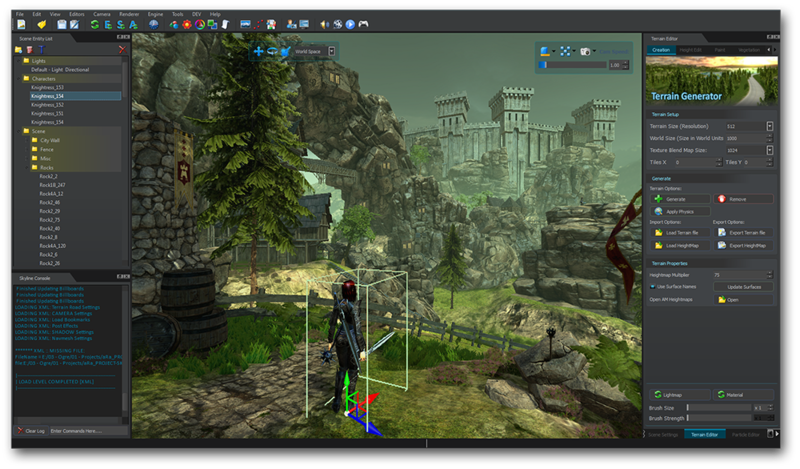 Umbra automatically optimizes your complex 3D models and it’s the secret behind the 3D rendering performance for many of the biggest blockbuster video games. It lets you render only the objects that are visible to the player, nothing else, and allows you to easily choose between graphical fidelity and performance, eliminating the tedious work that designers have to undertake for efficient visibility optimization as well as create complex 3D models and bring them into life in virtual or augmented reality. Pricing: Free trial. Plans based on request. Modo offers modeling, sculpting, texturing, painting and photorealistic rendering in one cohesive, easy-to-use content creation package, with unlimited network rendering capabilities included. 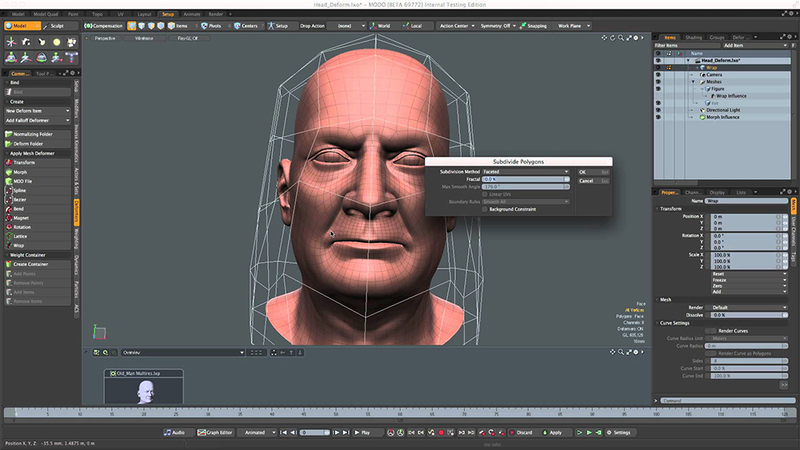 From roughing out volumes to creating highly detailed forms, Modo lets you focus on creation, not construction. With its advanced photorealistic viewport and progressive renderer, Modo lets you visualize your designs as you develop them, so you can discover their ultimate potential in less time. Games: CaddySHAQ, The Order: 1886, AIRHEART. OGRE is one of the most popular open-source graphics rendering engines. It offers a simple, easy to use OO interface designed to minimise the effort required to render 3D scenes, and to be independent of 3D implementation i.e. Direct3D/OpenGL. It does the common requirements like render state management, spatial culling, dealing with transparency for you automatically saving you valuable time while offering an example framework to make getting your game running quick and simple. 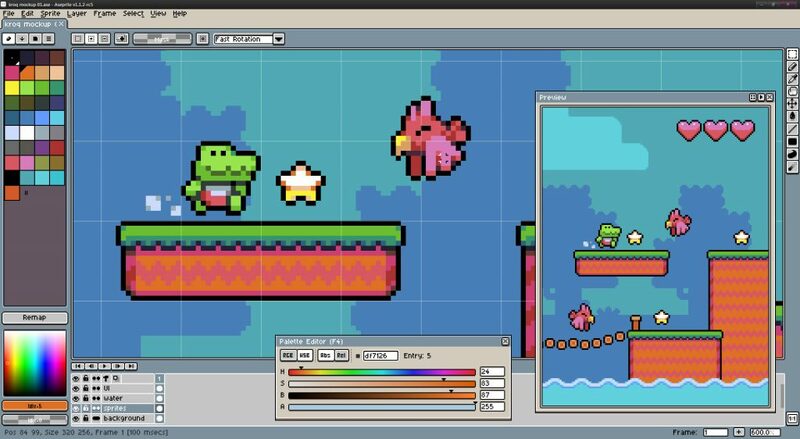 Aseprite is a pixel-art tool to create 2D animations, sprites, and graphics for games. It allows you to compose sprites using layers and frames as separated concepts through a timeline where you can copy/move layers, frames, or images. It also offers animation tools with real-time animation preview, onion skinning and tag frames, as well as pixel art tools including shading, pixel perfect strokes, RotSprite rotation, tiled mode, filled contour and more. Pricing: Free trial. License at $14.99.